DKL 6 was last night. What a night. I didn’t sleep much – I tried to, but my brain wouldn’t slow down. It was such a fun show to do, so many great moments with the guests. I took this picture just before I went onstage. I was standing there looking through the curtains at Mandy getting ready, (don’t you love that picture of you, Mandy?) 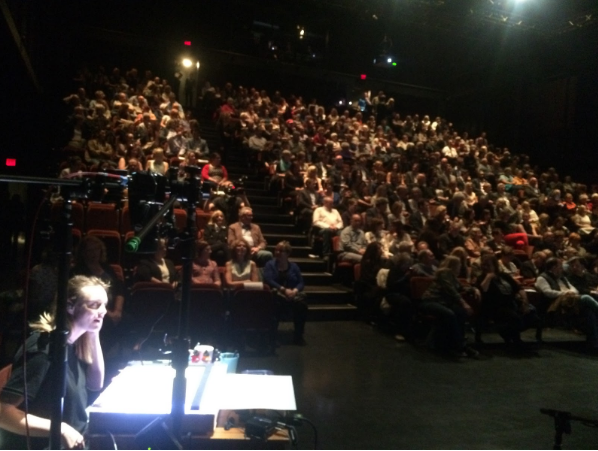 the audience was pumped, and I was nervous and excited, hoping everything would work out. Olympian Monique Sullivan was inspiring, and taught us that habits are more important than thinking. Danny Vacon and The Dojo Workhorse soft rocked the place apart, and for their final number were joined by the choir ONCUE, which gently brought the house down. So good. Mandy Stobo and IllFx, along with an amazing technical crew that my brother Rob built, performed a phenomenal opening number. 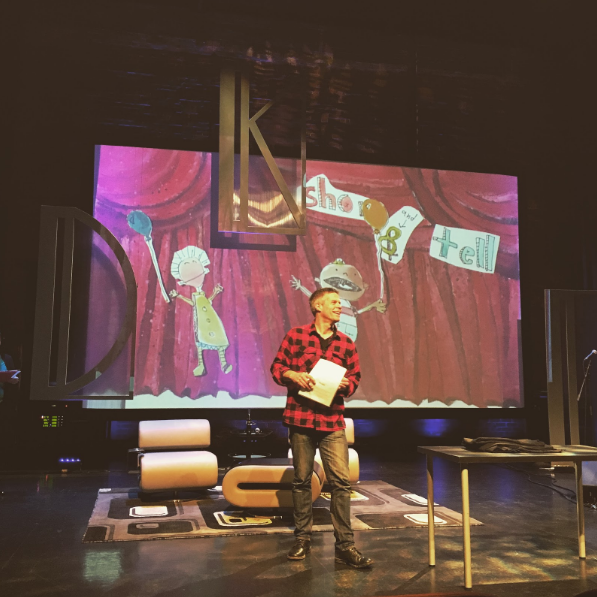 It was a ridiculous mix of high- and low-tech projections and puppets and live drawing and green screens. Inspired. We had a special surprise interview with Patrick. Surprise even to him. Our Canadians in Cars was ridiculous. We’ll show you the video soon. Jann Arden made a special video visit. As did the Mayor. He loves videos, no? 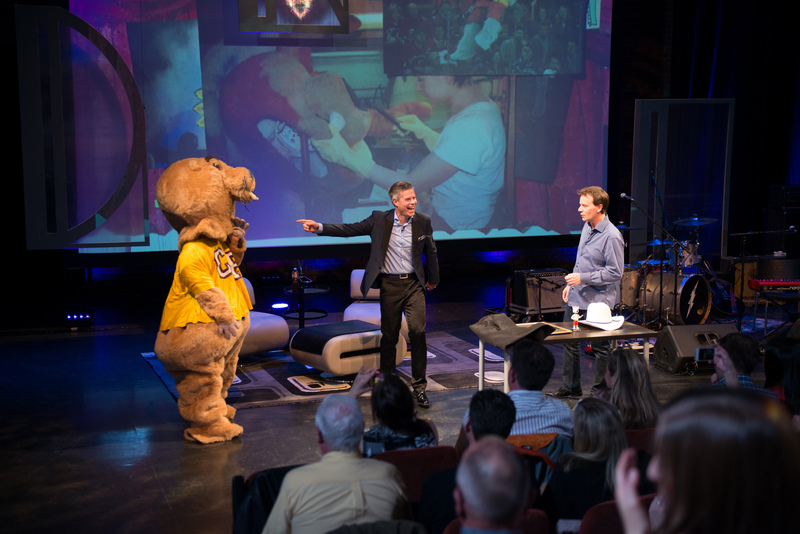 Glen Street, one of the great and unknown entrepreneurial stories of Calgary was our special Show and Tell guest. He runs Street Characters, which just happens to be the world’s No. 1 supplier of mascots. Seriously. The NFL, NHL, CFL, NBA, MLB, and, as of last night, DKL. He told the story of how his company started in the ‘80s and a one-off idea, and then grew to become the global powerhouse it is today. It’s true – the company is an actual global powerhouse in mascots. And no one knows about it here. When we asked him to come and be on the show, we had no idea what to expect. And then there was a hiccup. I asked him to bring a mascot to show off, maybe Harvey the Hound, but he said because of scheduling, he couldn’t. I asked for any others. Can’t bring any. I was disappointed, but I guess scheduling those things is like herding mascots. So during rehearsal of the show in the afternoon, we practiced the “Show and Tell” opening, with me introducing him, and then nothing. Now, I had planned for one surprise gag moment. 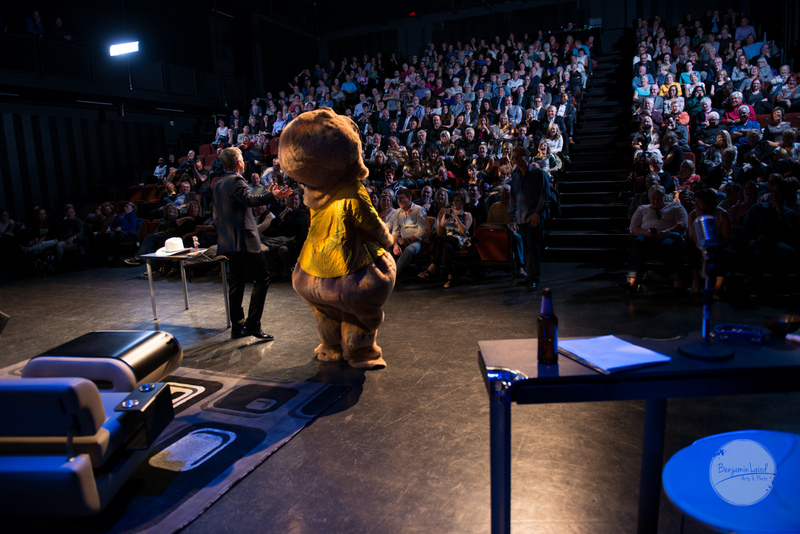 As some of you know, I like to pick on Jim Button from Village Brewery who hangs out with me on stage. So I asked Glenn if he could at least bring a mascot costume that he thought would be good for DKL. Then I’d force Jim into trying it on. Hilarity would ensue. Glenn said sure. That was the plan. But otherwise, there wasn’t much of a plan. We had my opening speech, then… who knew? This is me during rehearsal practicing the “Here’s Glenn….” without any idea of what would happen next. So the moment in the show comes and I introduce Show and Tell. Jim is told he needs to go offstage for a moment (he doesn’t know why) I bring out Glenn, show pictures of his mascots with major teams, with Obama, with Will Ferrell. Then he tells an amazing story about his company, and shows a few things including the first dollar they made back in the ‘80s. It was ridiculous. Jim could hardly walk. Glenn pointed out that Jim had put his pants on backwards… he had no shoes, he couldn’t see. It was magic. The audience was hysterical… and so was I.
Ha ha, I thought. No, you didn’t and I got you. 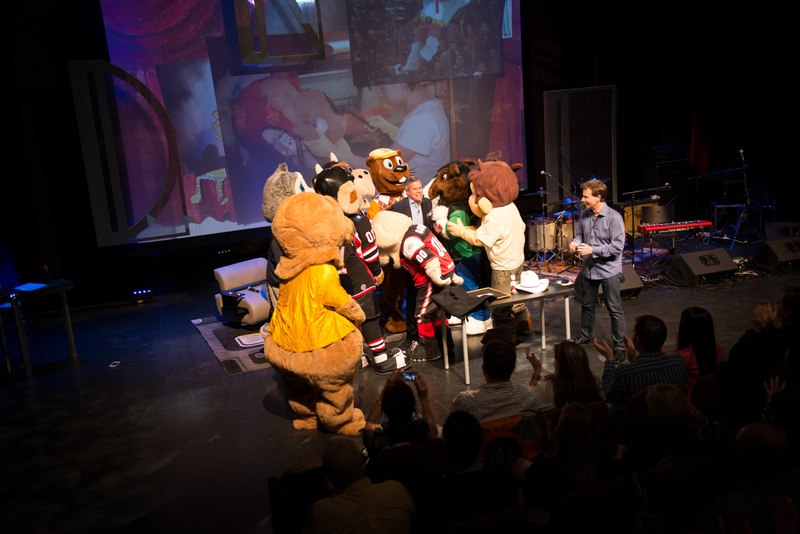 And from the wings come eight mascots who proceed to attack me. In a mascot attack sort of way. It was mayhem. It was ridiculous. And it was exactly what DKL is all about: An amazing crew at Kelly Brothers that works to bring together great stories and great people. Then we put it in a show, without exactly knowing what’s going to happen. And hopefully, it’s magic. Like last night.